Breathe Clear Nasal Strips is your solution to nasal congestion and loud snoring. Finally, some relief from restless nights and sleep disruption because of nasal congestion. Breathe Clear Nasal Strips delivers a remedy right to the source. Whether you are dealing with a cold, allergies or nighttime congestion these nose strips provide fast congestion relief without a capsule or liquid medication. Just peel, stick and rest. A restful night's sleep has never been so easy. Day or Night Time Breath Right Relief Deep Penetrating Nasal Strips for Snoring, Colds, Allergies and other Congestion-Related Ailments. Instantly Opens Nasal Passages to Improve Sleep. No more Sleeping Pills. The Breathe Clear Embedded Flexor Helps Completely Lift and Open the Nasal Cavities in the Deeper Regions of the Nasal Passageways. This Universal One Size Fits Most Noses and is Drug Free, Latex Free & Hypo Allergenic. The Unique Breathe Clear Design Contours to your Nose and Delivers Relief that can Beat Out the Best of Nasal Sprays. 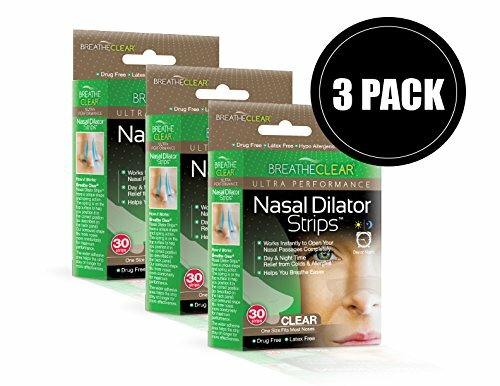 Breathe Clear Nose Strips Treat all the Needs for Nasal Cones, Special Congestion Spray, and any Complicated Congestion Machine All in One Breath Right Nasal Strip. Breathe Congestion Relief Nasal Strips Deep Penetration. Comfortable and Easy to Use Simply Wash Nose with Soap & Water, Dry & Place the Nasal Strip on the Center of your Nose. If you have any questions about this product by Breathe Clear, contact us by completing and submitting the form below. If you are looking for a specif part number, please include it with your message.